Stay On Trend With a One-of-a-Kind TV Lift Cabinet Trunk! Over the last few weeks, I’ve been reading up on the furniture trends for Summer 2013. One trend that seems to keep popping up is wrapped furniture. The furniture can be wrapped in anything from leather to eclectic fabric to textured materials like jute or rattan. I’ve seen wrapped dressers, wrapped side tables and wrapped headboards. Well, what about wrapped TV lift cabinets? 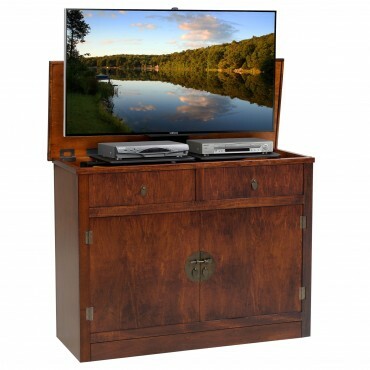 Luckily for you, TVLiftCabinet.com shopper, you can stay right on trend with one of our trunk TV lift cabinets! Antiquity and Carlton are almost identical, save for their different color leather – Antiquity is brown, Carlton is black – and distressing that is unique to each trunk . Both cabinets have hardwood straps with hand hammered nail heads for a chic vintage look. When not in use, the cabinet looks like a stylish leather trunk. When you want to watch TV, use the small remote control to magically reveal your TV and components! Another trunk that fits perfectly with the wrapped furniture trend is Bermuda Run. Bermuda Run gives off more of an island, beachy feel with its wicker matte covering. The finishing touches are the distressed leather accents and cast-metal antique hardware. All three of our trunks can hold up to most 47” TVs and come with a component shelf that can house 2 pieces of AV equipment – like a cable box and DVD player. Finished on all 4 sides, the trunks are ideal for use at the end of the bed or as a room divider. Besides wrapped furniture, what are your favorite furniture trends for the season? Are you trying to find a TV lift cabinet that matches your definition of trendy? Let us know in the comments! Here at TVLiftCabinet.com, we strive to make your online shopping experience as smooth and stress-free as possible. From detailed specs for each cabinet to a live chat with our TV lift cabinet experts, you can get all the information you need at a click of the mouse. Another service we offer that you may not be aware of is our free wood finish samples. That’s right – FREE! We just ask that you return the sample once you’re finished reviewing it. Don’t worry – we provide the return envelope with postage. Previously, only customers who called our office and spoke with one of our representatives would be told about the availability of samples since the service was not called out on our website. Now ordering your sample online is easy! Once you’ve narrowed down the selection of cabinets to one (or several!) that you’re interested in, just go to the cabinet’s product page and click on ‘Order Color Sample’. A pop up window will be displayed where you can enter your shipping information. Complete the form and click ‘submit’. Your sample will be sent within 24 hours and you’ll receive a follow up email from us confirming your order. Simple as that! Now you can be assured prior to ordering that the stain on the cabinet you love will fit perfectly into your home.